With over four decades of experience, Santa's Quarters™ has helped some of today's most recognized global brands in retail, fashion, and hospitality, as well as domestic and international government offices to make Christmas dreams come true. Companies such as Ralph Lauren, Marc Jacobs, Six Flags, and The Ritz-Carlton have relied on us for their commercial holiday decorations, and now you can benefit from our knowledge and dedication to achieve the same results. We offer a wide range of high end products that are specifically designed to meet the needs of even the most demanding commercial applications, with a strong focus on intelligent design, durability, and sensible pricing. Whether you need to decorate a small boutique or a large hotel lobby, our seamless shopping experience guarantees fast and hassle free ordering, with personal attention to detail. We ship worldwide via UPS, FedEx, and freight. Each year, Santa's Quarters™ introduces a new collection of shatterproof commercial Christmas ornaments reflecting the season's latest trends in colors, shapes, and finishes. 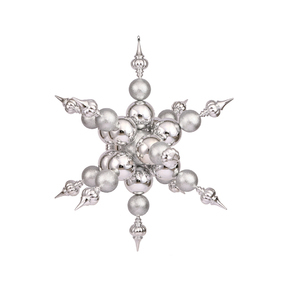 From classic baubles to fancy finials, our giant and large Christmas ornaments come in a wide range of sizes that allow you to decorate small spaces such as shop windows as well as giant Christmas trees and oversized areas like shopping malls and hotel lobbies. 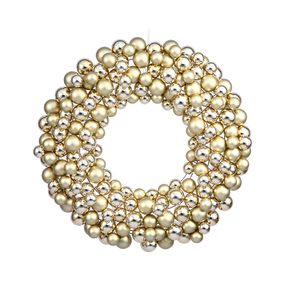 All of our commercial ball ornaments are UV-treated and weatherproof, so you can be sure to enjoy their gorgeous colors for years to come, whether they are displayed in sunny or sub-zero conditions. 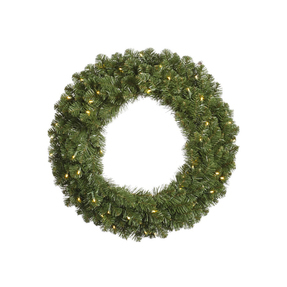 Our extraordinary selection of giant Christmas wreaths provides an easy way to add instant holiday cheer to indoor and outdoor areas, especially popular with hotels and shopping malls. Available up to an impressive 12' with our without lights (including energy saving LED lights) they are durable to stand up to even the most demanding conditions year after year. Lush foliage in luxurious shades of green and natural decorations such as pine cones offer you the perfect backdrop for endless decorating possibilities. To add a festive touch, choose from oversized weatherproof commercial bows in sumptuous red velvet and elegant gold. Innovation and environmental sensibility are at the heart of our business, which is why we are proud to carry top of the line commercial Christmas lights featuring super energy saving LED technology. Our extensive product range includes light sets, replacement bulbs, and stringers in numerous sizes, shapes, and colors suitable for indoor and outdoor use. We are particularly pleased to offer you our superb new line of lighted pole mounts made with impeccable craftsmanship. 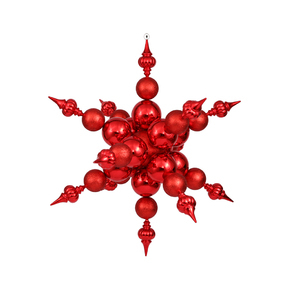 Designs include iconic Christmas symbols such as stars, snowflakes, wreaths, and bells, and are made of UV resistant materials outfitted with brilliant, super energy saving LED lights. For easy installation in just minutes, we include brackets and bands in our shipments for every pole mount. 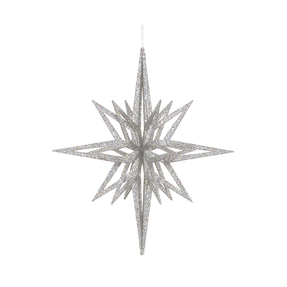 Our pole mounts are perfect for Christmas street decorations. With a sophisticated construction based on concentric metal steel rings, our giant Christmas trees are easy to set up and sure to impress with their lush, weatherproof foliage, crush- and fade-resistant needles, and professionally strung brilliant LED lights. Their stunning life-like appearance lends itself naturally to countless decorating themes and is guaranteed to last for many years to come. For municipal Christmas decorations there is no better centerpiece. 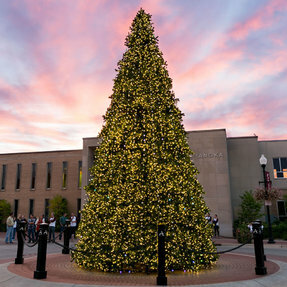 For peace of mind, our giant artificial Christmas trees come with a generous manufacturer's warranty both on the construction as well as the lights. Please contact us at 1-888-334-7527 for more information and ask to speak to one of our commercial tree specialists. We would be delighted to help you find the Christmas tree that's right for you. - Email us at [email protected] and we'll get back to you within 24 hours. 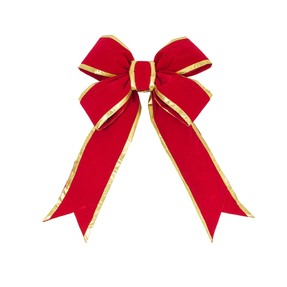 Gold Trim Red Velvet Bow 48" x 60"